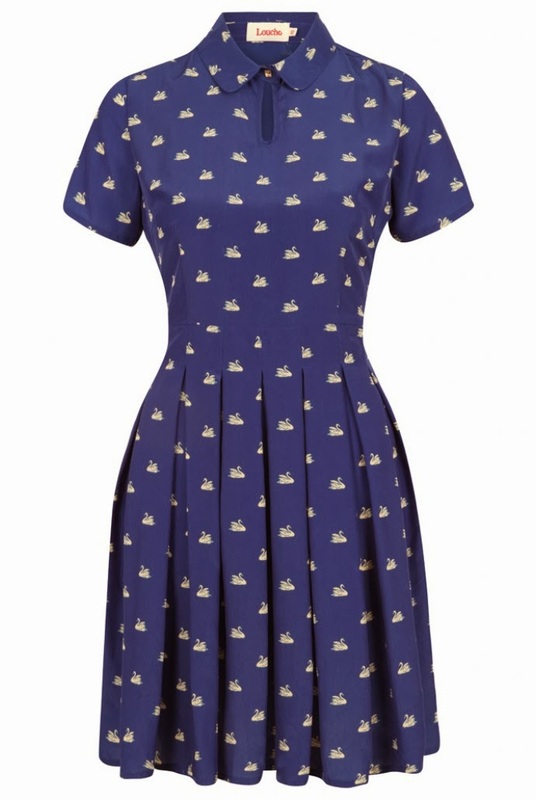 Surely a swan dress is the perfect thing to swan around in? Yes, yes it is. Then you too will look irresistibly pretty, yet have the power to break someone's arm by flapping your wings. Added benefit: no-one will be able to cook and eat you, else they'll have the Queen to deal with. And she can break your arm with her handbag. Ooft. Clearly I'm into blue print dresses today. This French Connection one from ASOS is allegedly covered in little daisies, but in fact I think they are fire flowers from Super Mario. Without the eyes. SADLY. Anyway, let's-a-go and buy it, yeah? Ah, sea green. A lovely colour, and one that oftentimes doesn't resemble the sea as we know it in any way. But who cares what the actual sea looks like, when you can float around in this Renn dress from Joy, pretty much personifying the most gorgeous, warm, sunshiney sea you can imagine? One where nappies and beer cans don't dwell. Just the odd message in a bottle for company. Wonderful. I do like a pretty pair of flats. And I do LOVE these London Rebel flats, with their T-bar and buckle and general greeny awesomeness. I'm not a huge fan of pointy-toed heels (my feet are too large already) but somehow a pointy flat doesn't have the same elongation problems. They just make me look more grown-up, which, at 34, is something I am still experimenting with. In my head, I'm 17. It's a colourful Spy this week, innit? Let's add a little monochrome, albeit with a dose of scarlet to liven things up. 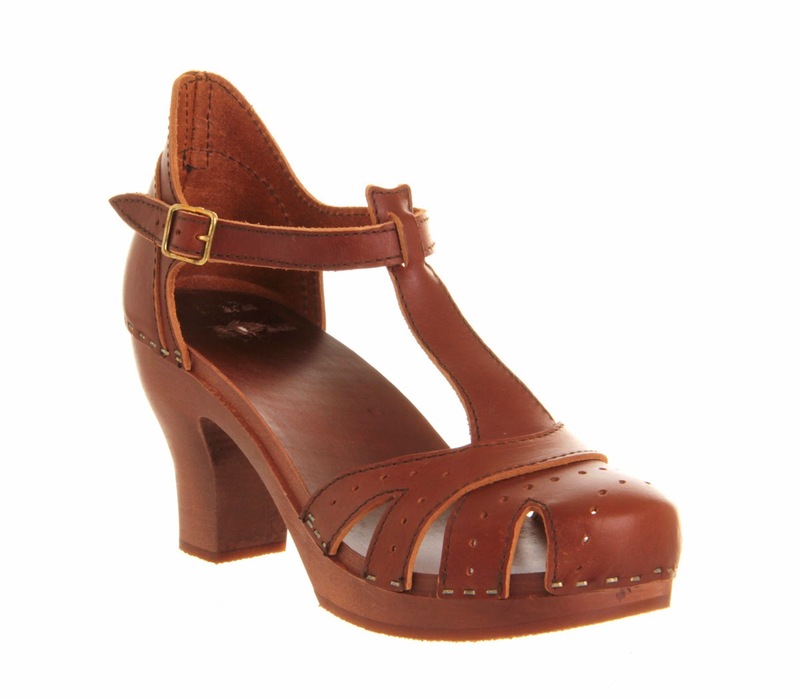 These Lola Ramona Elsie shoes are less than half price. I'm swooning all over that striped heel. Don't worry, my swoon won't be attached when you buy yours. Hands up who went along to our brilliant blogging and writing event at the Made.com showroom on Wednesday night? I have my hand very sadly DOWN, due to living approx. 464 miles away (yeah, I Google Mapped it just in case London had got closer to Scotland). While you lucky lot were swigging cocktails from Maverick Drinks, chowing down on delicious cakes made by Caleigh and Laura H, listening to 8 out of 10 Domestic Sluts impart their infinite blogging wisdom, and gazing upon beautiful furniture, I was at home SOBBING INTO TWITTER and snooping around the Made.com sale. So actually, I had a fun evening too, because I found a lot to love, not least this raspberry red Jersey chair. 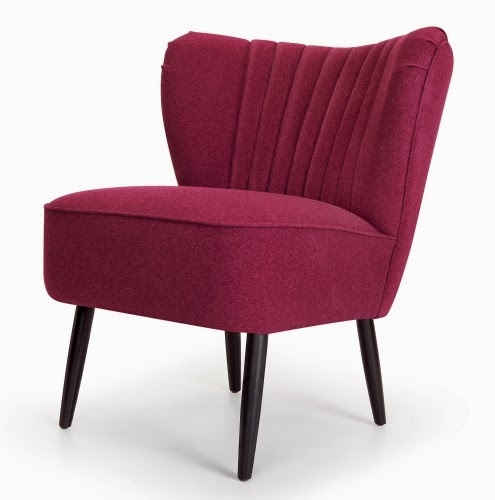 Just the thing to sit in while wearing your raspberry beret. Good Things are going on at Thornback & Peel right now. 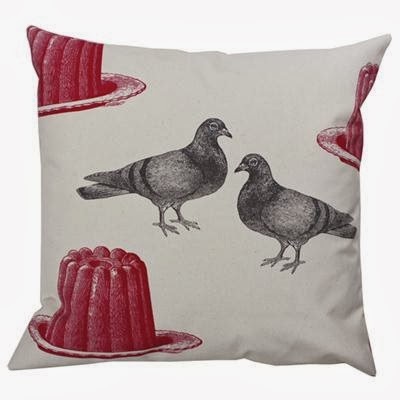 And by Good Things, I mean 20% off EVERYTHING, including this pigeon and jelly cushion. Well, including EVERYTHING, really. Just enter the code HAPPY20 at the checkout. Keep and eye on those pigeons, though. As soon as your back is turned they'll have their faces RIGHT in that jelly. 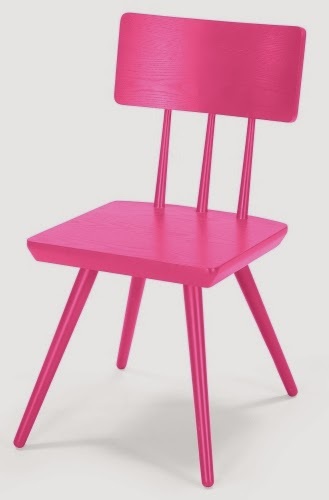 My absolute favourite thing today, possibly THIS YEAR, is definitely this bright pink Cornell chair from Made.com. I am in need of one more dining chair (for my living room; oh look, it's complicated), and this may be it. I am drowning in adore. Bought anything nice this week, mes amis? Got any plans for the weekend? What're you having for your tea? Let's CHAT. So now I'm happy and want to go out immediately to dance about in my nice new things. Lovely! 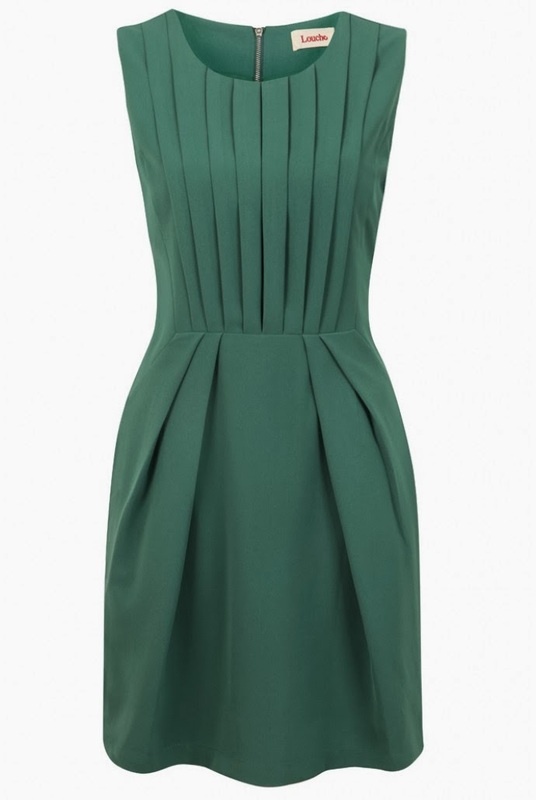 I wrote about the Tyler dress a little while ago but it wasn't nearly as reduced as it is now! Great bargain! It looks so lovely on. Like I'm totally professional without really trying very hard. It's probably what Glamour magazine would all an ideal 'office-to-wine-bar' dress. So much ace stuff! 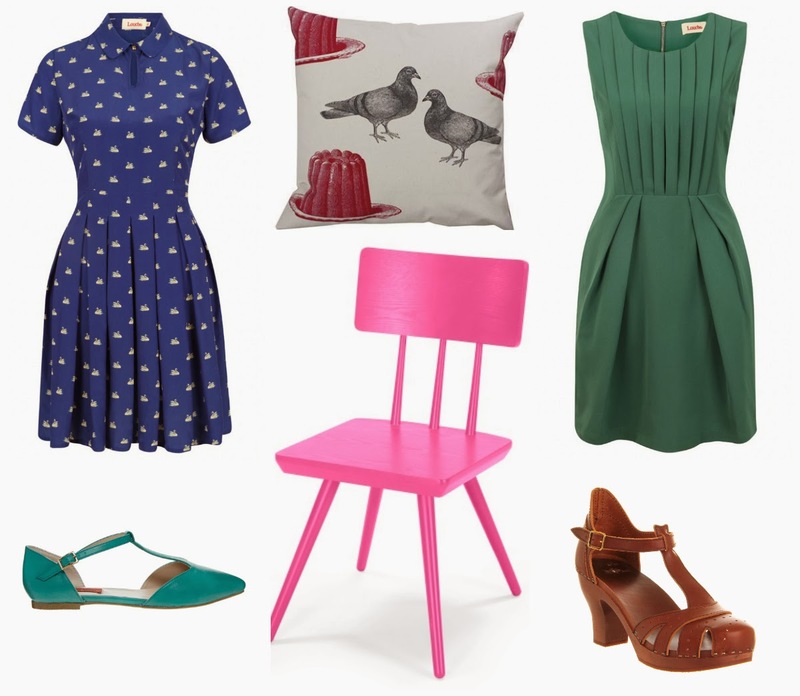 Loving the pigeon and jelly cushion (I am on a cushion kick at the moment for some reason) and the black and red stripy shoes. Totally missed you on Wednesday Laura B. We only had two Lauras. Two! Laura - I am quite into cushions at the mo, too. I blame the weather. Kat - that's not enough Lauras at all. And only one Brown, too. Shocking. Oh that's a shame! I've done that before - sometimes something looks gorgeous online and then I look at it in the shop and it doesn't look nearly as special. Let us know what you get in exchange! Oh it's so annoying when that happens! I had that with something last week - thank goodness for returns and seeing things In The Flesh. How annoying! Looking forward to hearing what you get instead though! At exactly 4:30pm today I will be catapulting myself out of this miserable office to go shopping with my beloved friend! First stop Homesense where we will laugh heartily at the fact they're selling actual knight-of-the-round-table type armour as home decor! Then we will hit all these sales to recover and eat tapas :) happy weekend everyone! Ha ha! And a happy weekend to you too! Yes! I have bought things in the sales this week, thanks for asking Laura. I also bought an embroidered and velvet denim vintage shirt from VVVintage (http://store.vvvintage.com/collections/womens). That makes it sound a bit grim but it's lovely in the flesh. I was hoping you'd buy that skirt, you've been swooning over it for ages. Oh yes! The skirt will be gorgeous on you, Frances! I bought the Vera velvet trim prom dress from Oliver Bonas in beige (http://www.oliverbonas.com/sale/sale_clothing/dress_vera_velvet_trim_prom_black.htm). Now I just need a prom date (and a prom to go to). Oooh it's much prettier in beige, isn't it? Good buying. Lovely! There will be no shortage of dates, I'm sure! I bought two pairs of gloves...one pair embellished with jewels. I'm having slow-cooked pork for dinner. I love the flamingo pink chair...and I love you! Hello, Mama B! I love you too.